These are absolutely gorgeous, Sherrie!! The flowers are so beautiful!! 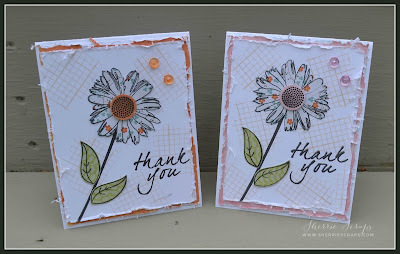 I love the distressed edges and the stamping!! They look amazing!! What beautiful cards!! Wow! These are wonderful. I am sure your friends that received them will put them on display and enjoy the pretty flowers. I like the distressed look too, but I always wonder if the edges need just a little bit more. Glad you were able to enjoy some family time...don't worry about the computer...it's not going anywhere! Sherrie these are so awesome!! What a great set of cards! Your friends will love them! These are so beautiful Sherrie!! Love the flower!!! Grandbaby time sounds like the best time spent!!! I loveeeeeee these cards! LOVING those gorgeous flowers!!!!!!!!!! 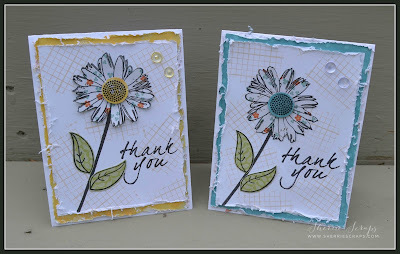 What beautiful cards - love the distressed edges! Those flowers are really pretty! Very pretty cards, the distressing looks so awesome! I love the pretty flowers too! I'm sure your friend loved these! I'm so Happy you had a great time with those adorable grand babies.... I bet they wore you out! I think we forget how much work they really are.... and as we get older it hits us like a brick! I felt that way when I stayed with my niece for a few days about 2 yrs. ago.... Her children are so sweet... and my boys are big already so I don't have to wake up at 6am anymore.... but when I was there.... they just talked & talked & talked & wanted to do this, & that, & this again! Boy I was tired and said to myself... I'm so glad my kids are big! HAHA!!! Any who -- your cards are soo pretty! I just love the flowers.... :) Have a Crafty Day!!! Your thank you cards are so very pretty! 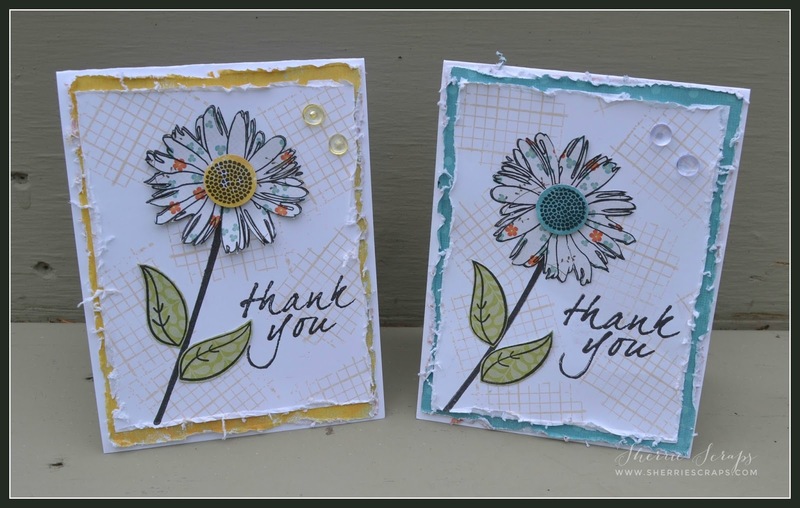 I love the distressed look and that daisy flower is very pretty. I love it actually. Great color choices of cardstock too! Such a pretty collection of cards Sherrie....love the sprinkling of skittles! What a beautiful set of card. Love the distressed edges and those flowers are fabulous. Sounds like you had a wonderful time with your grand babies ! I love your night time routine ! These cards are so pretty and sweet my friend ! Love them ! Hope you have a wonderful and blessed day ! I really love the distress technique on your cards!! I must try that! Pretty skittles!! 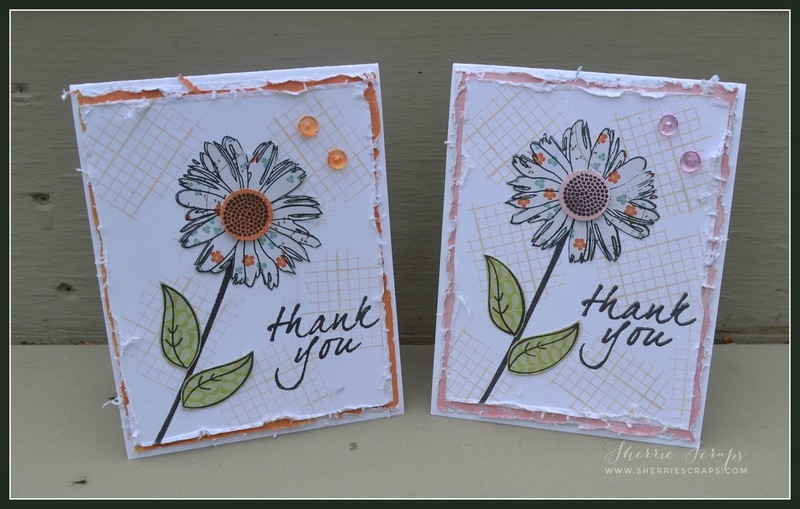 I love the look of these fab cards, Sherrie! That Authentique is beautiful, the distressed edges are terrific, and I am so glad you made extras! These are beautiful, Sherrie! A gorgeous way to say thank you! The flowers are stunning and I love the backgrounds! The ultra distressed edges are fabulous and I love the varying shades you used throughout. What a lovely set! Wonderfully done, my dear friend! They will be so appreciated. :o) Have a blessed day! These are so beautiful! What a GREAT card design and love those flowers!! !